Well, what if you want to browse the web? I want to use Chrome! Or you could use Lynx … but I’ve heard it’s not CSS3 compatible. This is a little tutorial that will take you through all the steps to have GUI access to a Google Compute Engine instance. Important: if you start an instance you’ll be charged per minute. Go to the end of this post to see how to stop it and get $300 in credits! Update: My next post will discuss how to make this connection secure by using VNC over VPN. Visit the developers console, log in, and create a project if needed clicking on the Create Project button. 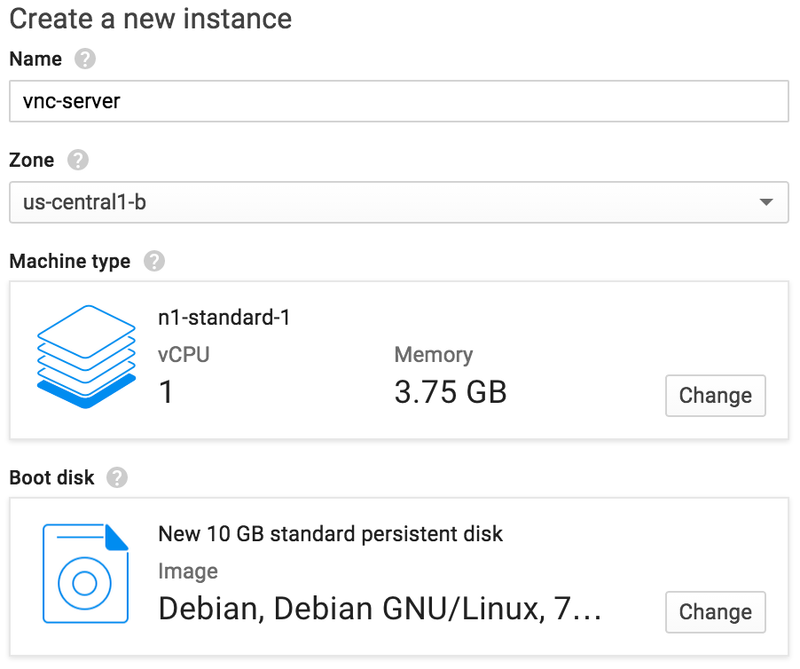 Navigate the left menu to list the VM instances running on your project: Compute > Compute Engine > VM instances. If it’s the first time you do this for this project it might take a bit longer, since it’s setting some stuff up, don’t worry this happens only once. Click on the Create Instance button to access the instance creation form. Choose a name for your instance. Any instance type and linux distribution would work, but if you want to go with something safe choose n1-standard-1 with backports-debian-7-wheezy-v20150423. Choose a zone close to you to have the best latency in your connection. If you’d like to use Windows the instances already come with support for RDP (Remote Desktop Protocol) so you don’t need any extra steps. Once your instance is running you can SSH directly into it by simply clicking the SSH button. This also handles the authentication for you, really handy! Gnome is beautiful … and heavy! So be patient while everything gets installed, two to five minutes is completely normal. Note: this password will grant access to your instance, so make it strong. There’s many options available, my favorite one is RealVNC Viewer. Install one but don’t try to connect to your server just yet: it will fail as the firewall rules don’t allow it. In order to communicate with our instance we need its external IP. You can find it on the Developers Console. Find your external IP, it should look something like this. Regardless of the tool you use the connection will fail, this is expected as the firewall rules block all communications by default for security reasons. Navigate to the configuration for the default network “Compute > Compute Engine > Network” and then click on default. Or you could also click here and choose your project. We’re going to add a new firewall rule, pressing the corresponding button. Choose a descriptive name for the rule. We will allow traffic coming from any source, which is why we use 0.0.0.0/0, the IP mask equivalent to a wildcard. The traffic will be on the port 5901 for protocol TCP and going to instances tagged as vnc-server. Great! Everything seems ready for our VNC client to connect. 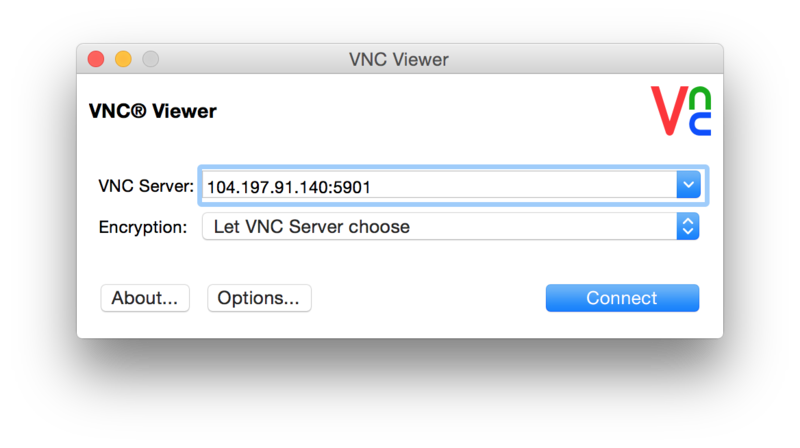 Open your VNC viewer and connect to the IP of your Compute Engine instance on port 5901. Connect to your Compute Engine instance on port 5901. To connect you’ll need to provide the password you gave at the beginning of this tutorial. And voilà! 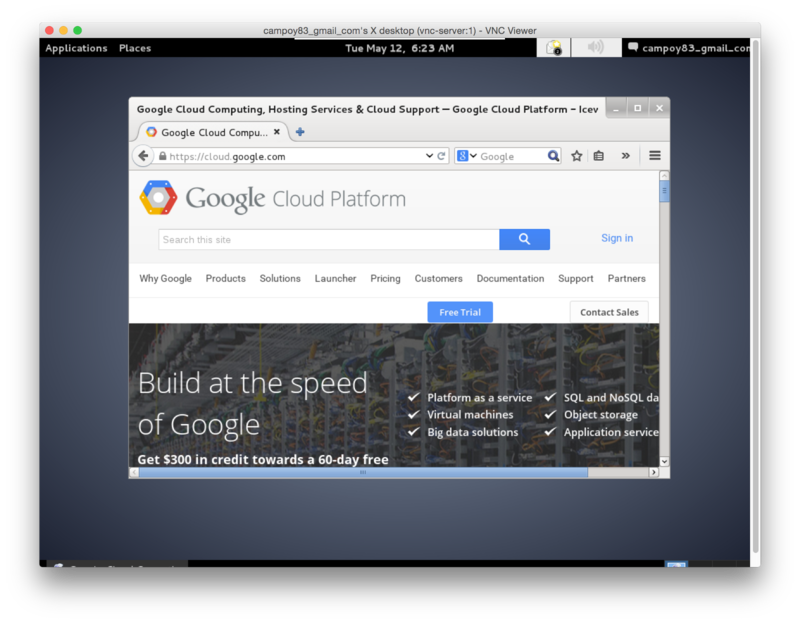 You can now use your favorite Desktop environment on your Google Compute Engine instance. 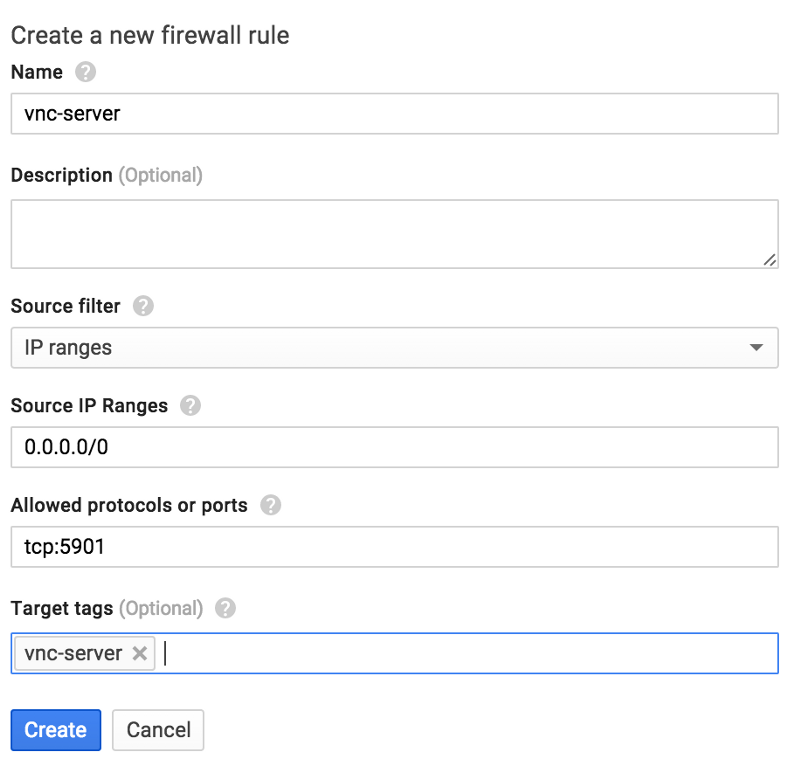 If you still cannot connect to VNC after you have created a firewall rule you should make sure that your IP has not been banned by sshguard. An instance running on the cloud has a cost but the good news is that you can simply stop it and restart whenever you need it again. Click on the Stop button and you’ll be charged only for the associated disk which at the moment of writing of this article is 40¢ per month. I dare you finding a cheaper cup of coffee in San Francisco! Finally, if you’re new to the Google Cloud Platform make sure to get into the Free Trial to access $300 in credit so you can try it out and have some fun! I hope this was useful. Feel free to add any comments for feedback or questions on twitter.